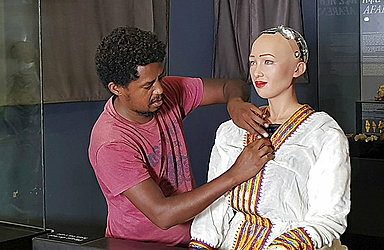 The robot, made in Hong Kong by Hanson Robotics, is fitted with software in part developed by Ethiopians and has been programmed to speak the country's official language, Amharic, as well as English. "We need to maximize the benefit of this technology and also prepare to deal with its downsides," the prime minister said. The robot came to the East African country for an information technology expo.